What’s On Your Style Bucket List? That phrase – “bucket list” – is getting a bit hackneyed. It’s OK if I use it again today? This time to mean, what wardrobe pieces, or hairstyles, or makeup hacks do you want to experience before, well, you know about the bucket. Many years away, we hope, but let’s not wait too long to try some fresh, fun things. I love, love her hair. Source. Or maybe not . . . it’s $2,000 . . . on sale. This vintage coat will be fabulous, at $100 from Suzanne’s Etsy shop. 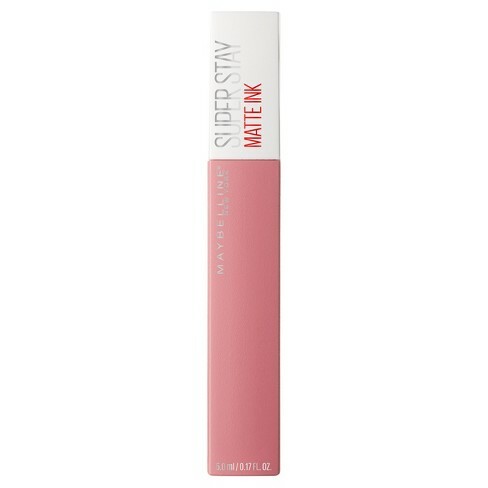 Maybelline Super Stay Matte Ink Lip Color. It’s pretty darn good. And while we’re filling our buckets, peace for you all, more tolerance and more empathy in the world. More putting ourselves in others’ shoes, more music, more laughs, more love. Nearly clicked on that link to the red raincoat. What a beauty. What a price. Eyelashes: I am currently using a serum which you apply on the roots of your lashes every evening before going to bed. My lashes are getting really luscious. Not very much thicker (but I have better mascara now as well), but definitely longer. This will do me fine as I am afraid I might be allergic to the glue of false lashes. Lipstick…. I found the perfect red lipstick. Doesn’t bleed (very important, especially with red), stays on pretty well (although not as good as these lipstick that dry your lips so you look like a mummie) and it stays moist. One drawback: the price. Which is high. It is by Sensai, and is called The Lipstick, number 1, Suou and it is bright red. That red coat or a similar version of it is also on my bucket list. It is so fabulous, but like you, I find that price point prohibitive. Be careful with eyelash extensions as sometimes they can damage your own eyelashes. I am trying organic castor oil to see if mine will grow out a little. But I do use false eyelashes from time to time for photo shoots and special occasions. 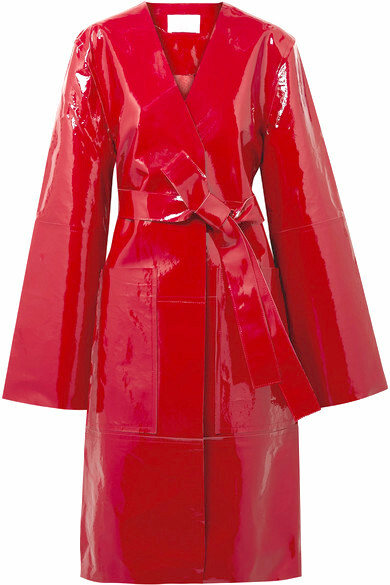 How INSANE is that patent leather coat??? Wow! But it looks like it might not move so well. Your hair is almost already like that, pretty damn amazing. I’m addicted to my lash extensions and fake ones on top of them for added drama. Just find the right person for those lash extensions. There are loads of people that don’t have a clue as to what they are doing and will stick the lash to your eyelid which is not only very wrong, but painful when it grows out. If you want, the next time you come up here for a visit I can get my gal to do yours. She is awesome. I’ve been going to her for like five years or more now. Thanks for the shout-out! 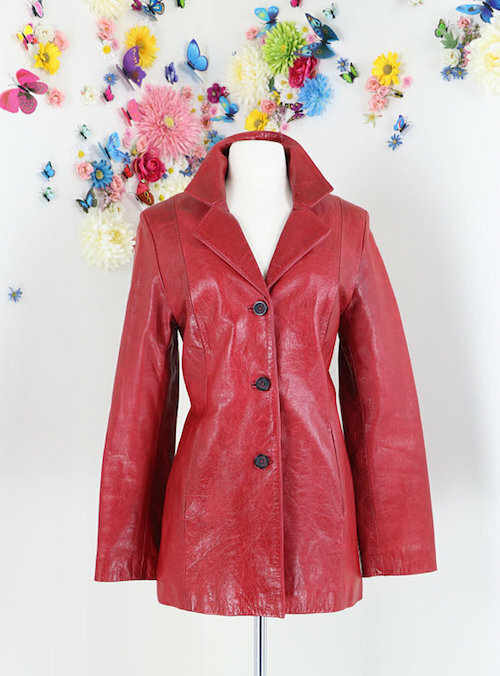 I’d addicted to buying red leather coats. Sherry grabbed a great one from my store, trench style. That offing raincoat—-holy moly it’s incredible. I sort of wish u would. Patent leather. Suzanne’s vintage one is pretty sweet, too. 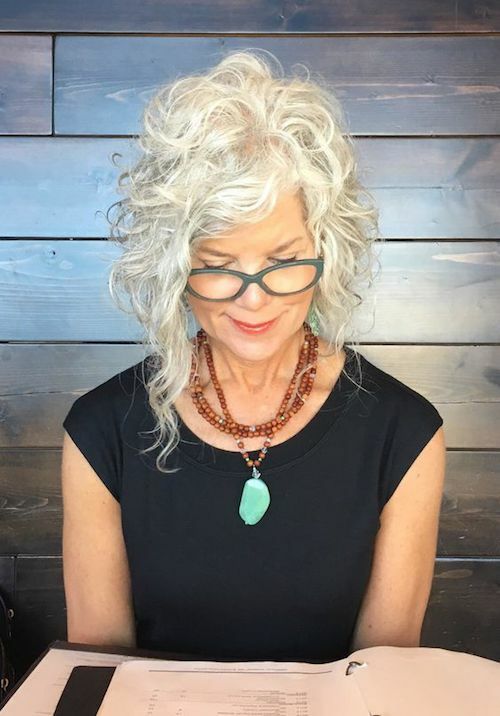 That lady’s curly shag is super cute, very flirty and fun and flattering. I just rly attempted fake eyelashes this year (42 heyyyy wish I’d started sooner) and I love it—-just takes practice. Get extra tubes of glue and I use tweezers to apply. Super attractive look—not gonna lie. I’d love hair like that, you should do it, it would look fabulous! My hair is lacking int he wave department for such a cut, but if you’ve got it (and you have), take the plunge! I’d like to find a pair of jeans that are slouchy, but fit on the hips, turn up and are slightly distressed dark denim … and don’t cost an arm and a leg. My downfall is that I hate jeans shopping and avoid it like the plague. I’m hoping they’ll just jump out at me one day from a charity shop rail.